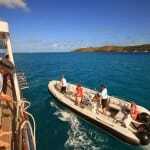 ASA Sailing Vacation on Arabella in the British Virgin Islands! The American Sailing Association has partnered with yacht Arabella to offer exclusive and discounted sailing vacations every winter. 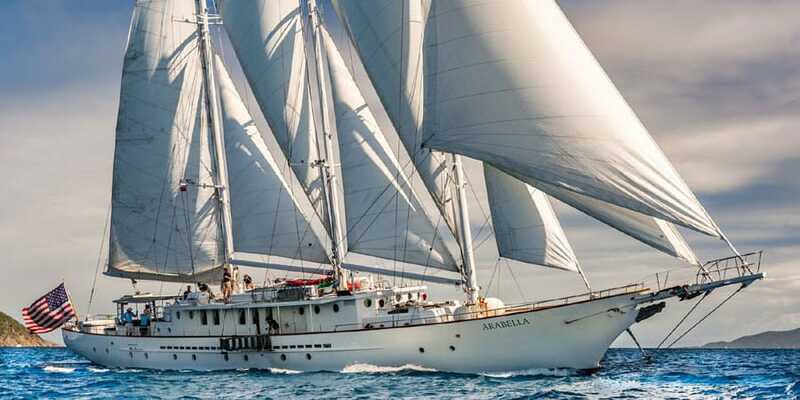 Arabella is one of the most beautiful sailing yachts in our country ([video_lightbox_youtube video_id=”La83fmNxZQY&rel=0″ width=”640″ height=”480″ anchor=”watch video”]). She epitomizes classic elegance and graceful style. Arabella has been an icon along the East Coast in summer and in the Caribbean in winter. She has hosted thousands of guests, provided incredible sailing experiences and created lifetime memories. Not only is Arabella a luxurious mega yacht, but she is also an incredible sailing vessel. The captain & crew love to hoist the sails, turn off the engine and feather the prop. Then Arabella really performs her magic as she slices through the water powered by the wind. Everyone deserves this type of mega yacht sailing experience at some point in their lives. Everyone deserves a great winter vacation and this will be one of your greatest sailing experiences ever. 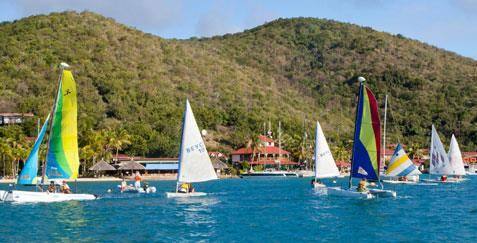 You’ll start your incredible sailing vacation in Road Town, Tortola. 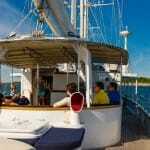 Guests should arrive in the BVIs on Saturday. There are two common ways to get to Road Town – you can fly to St Thomas and take a ferry to Road Town, or you can fly to Beef Island on Tortola and take a taxi from the airport to your hotel. 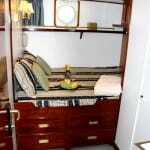 The cruise on “Arabella” begins on Sunday morning. On Sunday morning, start with breakfast at your hotel or at Village Cay Marina. The “Arabella” is too deep to come into the marina so she waits for you at anchor outside the harbor. Meet us at the Village Cay dinghy dock between 8 and 10am and our crew will deliver you and your bags to the yacht. Once onboard, you will meet the Captain, receive your cabin and be able to stow your bags. Once everyone is onboard, we will hoist the anchor and set sail for Marina Cay. By mid-afternoon, we will arrive off Marina Cay and drop our hook. There is good snorkeling nearby. You can go ashore on Marina Cay and walk to the top which gives you a perfect view of the sunset. Dinner this first evening will be onboard. After dinner, you may wish to head to Scrub Island or the Last Resort for some late night entertainment to jump start your sailing vacation! Monday morning starts with tea and coffee outdoors on the aft deck of your mega yacht. The warm sun will feel refreshing on your skin. 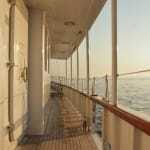 After a leisurely breakfast, the crew will weigh anchor and we’ll begin sailing upwind. Along the way, we will pass the island formation known as “the Dogs”. Then we will pass Mosquito and Necker Islands which are the famous homes of Richard Branson. After entering North Sound we’ll anchor and then you can begin your exploration at the world famous Bitter End Yacht Club, a great place for a frozen pina colada on their outdoor Almond Terrace! In the evening, there are 3 main options for dinner – Fat Virgins, Bitter End Yacht Club and Saba Rock. Or if you wish to go upscale, you can see if Yacht Club Costa Smeralda from Italy is accepting outside reservations. Their clubhouse is unmatched in luxury and sophistication and they sometimes allow guests to visit but you will need to dress nice! 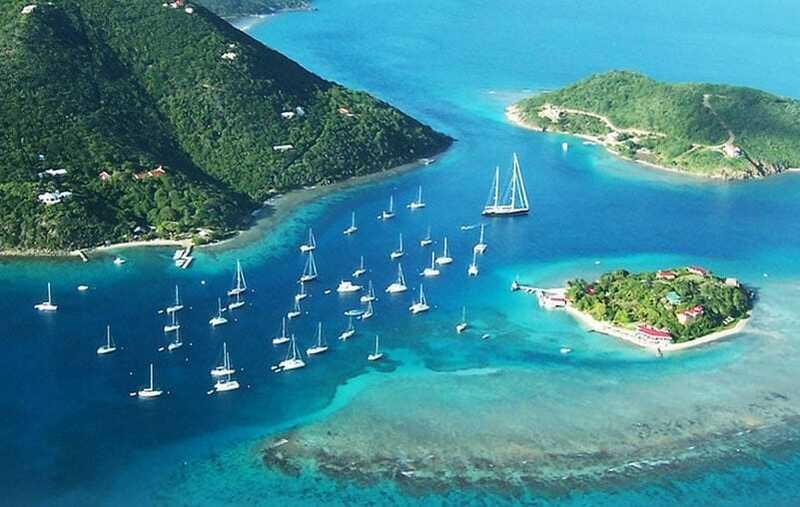 North Sound is the activity capital of the BVIs! 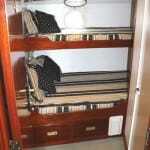 “Arabella” will have her kayaks and Pico sailboats in the water for you to enjoy. You can also rent other sailboats from the Bitter End Yacht Club, including Hobie Cats and Lasers. Bitter End also offers dive trips and kite surfing lessons. Guests who enjoy hiking can take advantage of several trails which lead up to the top of the surrounding hills. You can also just choose to relax with a book on a beach chair or be pampered with a message at the Bitter End spa. There is lots to do in North Sound! At sunset, join your Captain on the after deck of your mega-yacht for a special evening cocktail. 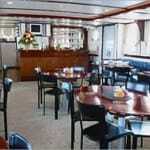 Then you can head off to a great dinner ashore. We will weigh anchor on Wednesday morning after breakfast and head to Spanish Town. There you can hop in a taxi to The Baths – an incredible wonder of huge boulders on the beach. In the afternoon, “Arabella” will head over to Cooper Island where there is more good snorkeling. Plan to spend a few minutes ashore among the palm trees at the beautiful Cooper Island Resort Hotel. Jost Van Dyck is north of Tortola and we will sail there in the morning. Our first stop will be off White Bay where you can dinghy ashore. This is home of the famous Soggy Dollar Bar. The sand beaches are an unmatched brightness of white and you can stand waist deep in the warm water and sip a frozen drink from the Soggy Dollar. 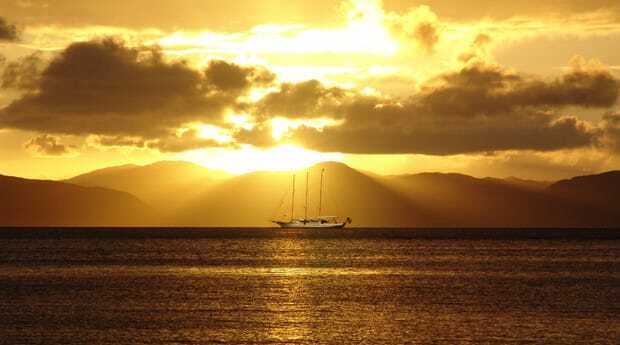 In the late afternoon, we will head over the Great Harbor on Jost Van Dyke. After a sunset cocktail onboard the boat, you can head ashore to the world famous Foxy’s Tamarind bar or one of the other restaurants ashore for dinner. If it is a popular night, maybe there’ll be some music and dancing at Foxy’s! After a late night at Foxy’s, we will start Friday slowly. 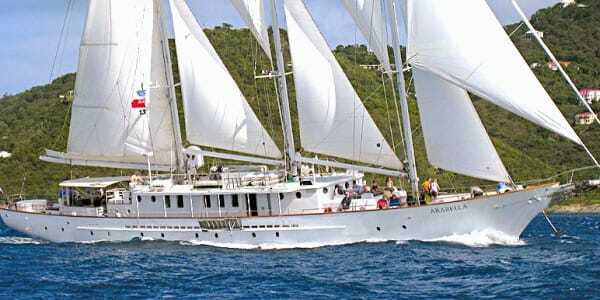 “Arabella” will sail over to the Bight in Norman Island. 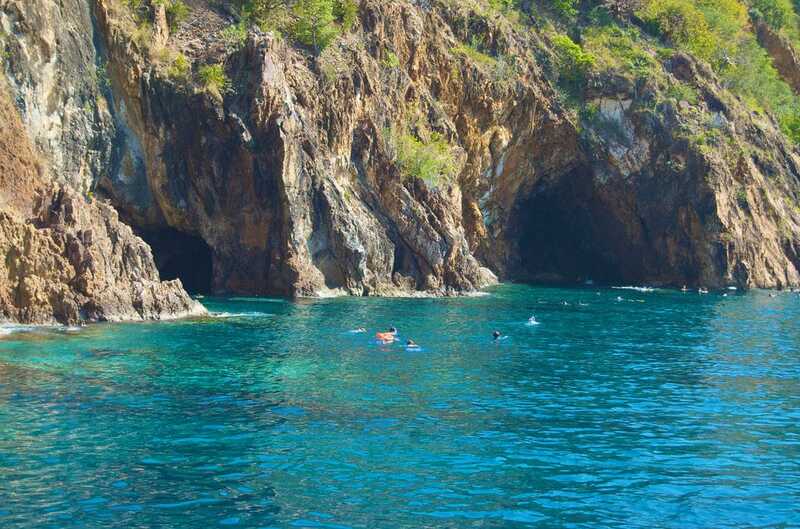 There is excellent snorkeling at the Caves or the Indians. Dinner will be served onboard this evening. After dinner, guests will be able to motor over to Willie T’s, one of the famous bars in the Caribbean. After absorbing all of the Caribbean sun for a week, late night revelers are known to fully embrace the spirit of the Caribbean by shedding their clothes and jumping into the water from the upper deck. As much as we would like to continue, all good things must eventually come to an end. The morning sail across Sir Francis Drake channel is a great final ride to celebrate an exceptional week of sailing. “Arabella” will anchor outside the Village Cay Marina and then deliver guests ashore by tender. It is usually possible to fly back home this same day or spend one or more nights in a hotel room and fly home another day. A centerpiece of the after deck is Arabella’s hot tub. It fits 6 people and is very popular after swimming as well as into the evening and night. 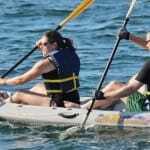 There are also four 2-person sea kayaks onboard which you can paddle around the harbor or explore a private and secluded beach. The main salon on Arabella offers lunch & dinner seating for up to 40 guests. There is also a beautiful mahogany varnished bar where drinks are served at cocktail hour. 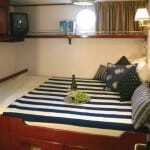 Arabella offers 20 well-appointed private staterooms. 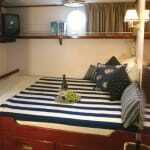 Each stateroom is outfitted with a private shower, head and individual climate control. Arabella’s tender is the 20 foot RIB tender known as “Retriever.” She is USCG certified for 12 passengers and will bring you to and from shore as you desire. 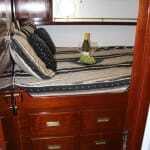 The aft horseshoe veranda is covered and provides for relaxation in the shade.